Speaking of empty - You don't think that any one of us was traveling on empty stomachs, right? In the camper we had coffee and tea, homemade pumpkin spice muffins and cranberry pecan bars (recipe below), banana bread, cheese and crackers as well as (of course) deliciously fresh honey crisp apples from the orchard. We did not even have room for lunch and knew Diane had a sumptuous dinner waiting for us back in Minneapolis, so onward we went! 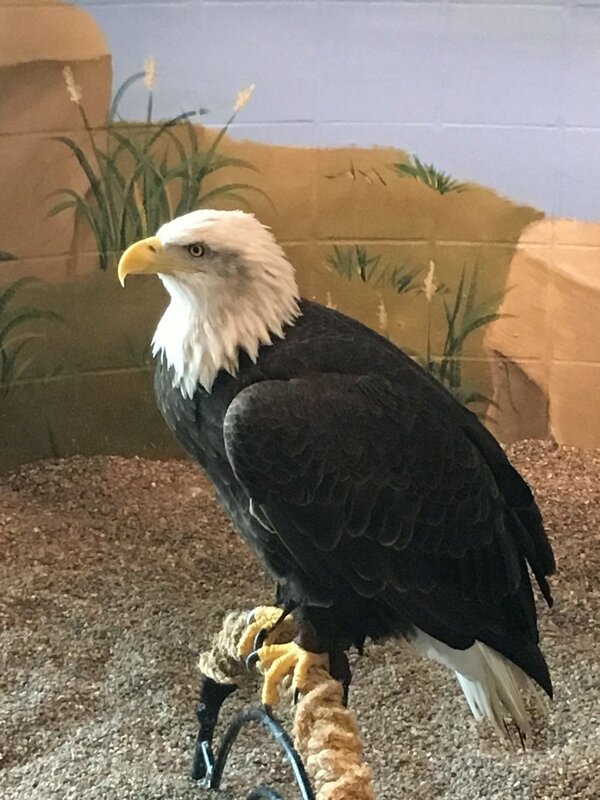 Next came an educational stop at Wabasha's Eagle Center, coming face to face with our national symbol. Close and personal - we were struck speechless (did not last long...). Their size, strength, intelligence and beauty were awe inspiring! Here's an interesting factoid we learned: Bald eagles can spot a rabbit from 3 miles away!! Amazing! As the sun was setting, we headed back into our camper and settled in for the drive with the canvas of the blazing skies unfolding alongside us. Beautiful! 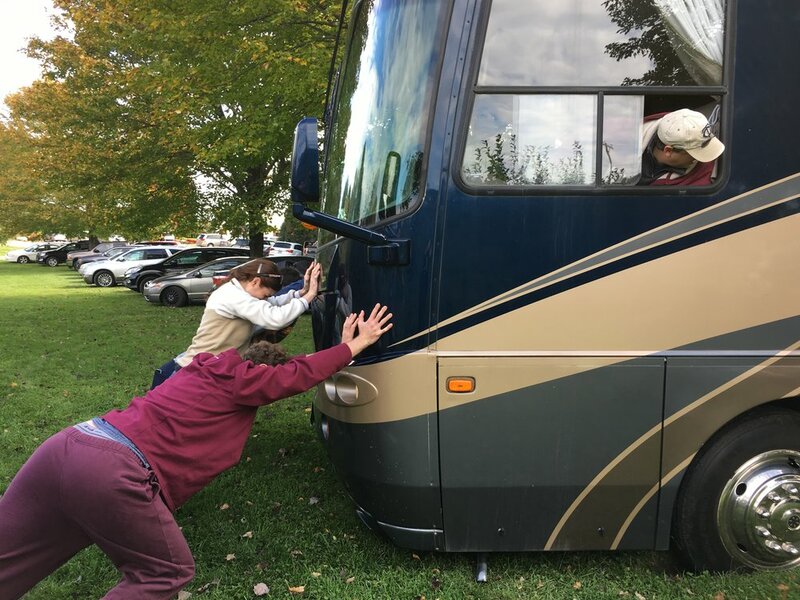 As we approached home, all the nappers were shaken awake, the Rv was tidied up and bellies were rumbling. So, off to Diane & Ivan's house we sailed! Diane's dinner of Leek Soup, Cauliflower Pie and salad was delicious and hearty as expected and we polished off some more of my cookies and my Pumpkin Biscoff Parfait (recipe below). 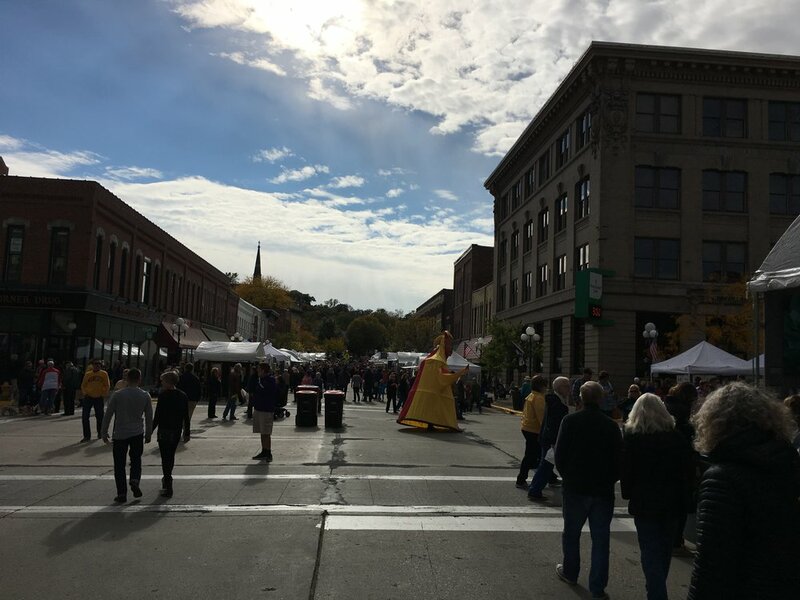 A little shopping, some nature, apples and pumpkins and a lot of sunshine and laughter with friends - A perfect Fall day in Minnesota! 1. Chop the dates: Process dates in a food processor until small bits remain (about 1 minute). It should form a "dough" like consistency. 2. Toast the oats and nuts: Toast your oats and pecans in a 350 degree F oven for 10-15 minutes or until slightly golden brown. The toasted factor adds another layer of flavor and crunch. Place oats, almonds and dates in a large mixing bowl - set aside. 3. Binder: Warm honey and peanut butter in a small saucepan over low heat. Stir until thoroughly combined, add vanilla and pour over oat mixture and then mix, breaking up the dates to disperse throughout. 4. Form Bars: Once thoroughly mixed, transfer to an 9x13 inch baking dish lined with plastic wrap or parchment paper so they lift out easily. Press down firmly until uniformly flattened - use something flat, like an offset spatula, to press down and really pack the bars, which helps them hold together better. Remove bars from pan and slice into 24 even bars. Store in an airtight container for up to a few days. Bars can be placed in the freezer to keep them extra fresh, but it isn't necessary. They can also be wrapped individually. 1. Substitute cranberries with currants, raisins or any other dried fruit. 2. Use a mix of nuts instead of just pecans. Almonds, hazelnuts and walnuts work well. Make the crumb mixture: Place the Bischoff cookies in bowl of food processor and pulse until fine crumbs are created. Drizzle in the melted butter and pulse to combine. Set aside. Make the pudding mix: In the bowl of a standing mixer combine the pudding mix, pumpkin spice, puree, vanilla and 2 cups heavy cream. Whisk all together until light, fluffy and creamy. Make the ganache: Pour 8oz of heavy cream into a 4 cup glass measuring cup and heat in microwave on medium until it just starts to simmer. Place chocolate in the hot cream and let stand for 1 minute or so. Whisk together until smooth and creamy. Assemble: Place about 1T of the crumb mixture in the bottom of each cup and tap down. Pipe in about 2 T of the pumpkin mixture and then drizzle with about 1T of the chocolate ganache. Top again with the pumpkin mixture followed by the chocolate and then sprinkle the top with some of the Bischoff crumbs. Refrigerate to set. Mini parfaits can be made 1-2 days in advance. Notes: Made in 5oz disposable clear plastic cups.